The Book Chook: Hey Dad, Time To Read! Creating a culture of reading in the home has never been easy. The task has traditionally fallen to Mom. However, with both Mom and Dad working outside the home in many families, Dad must be engaged in the effort. Kids look up to Dad, and when they see him involved in literacy activities too, it helps them to love reading. Below are some practical actions that any family can take to create a reading culture at home. Dads: pay attention, you can do all the below actions just as well as Mom. Where did your children’s books come from? Is your book collection an assortment of books that you received as gifts? Did you receive them as the toy in kid’s meals? Are they hand-me-downs from a cousin? Or, are they carefully selected? Adults spend time and effort finding books to read. We don’t walk into a bookstore, pick up the first title we see and read it dozens of times. With limited time available for reading, you can’t afford to have a pathetic book collection. By listening to your child’s interests, you’ll understand what kinds of books they want. Go shopping either online or at a bookstore. Take time to browse and select books that you want to read together. In other words, pick winners. Reading together will take on a new level of meaning when your collection is deliberately selected rather than a hodge-podge of books of uncertain origin. Good reading habits will be the result of deliberate effort. Put reading time on your schedule like you would any other task or appointment. Reading time can be in the morning, at bedtime, or whenever works for your family. There is always 15 minutes to sit down with a book at some point during the day. Once you have gone out of your way to make time to read for a couple of weeks, reading will become a natural part of the family routine. Read with enthusiasm! Doing so will make your child more excited about the story and ultimately, about reading. Don’t be afraid to make silly sounds and gestures or speak with an accent. If you are having fun, your child will have fun too. You might be an important lawyer or executive during the day. Guess what? Your child doesn’t care how important you are at work. They just want special time with you. Being fully engaged in an imaginative story is also a great way to relieve stress and will put you in a better mood. Dads tend to have a greater ability to be silly with the kids. We are more in touch with our thirteen year-old selves than we like to admit. Let the fun flow with reading time. Nothing ruins together time like mom or dad taking a call or checking a message while reading with a child. Unless you’re a doctor on call, there is no message, email or phone call that can’t wait 15 minutes. Children begin learning the day they are born. When an infant hears your voice as you read a book, they hear you use language as you follow words and images on the page. You are teaching your child vocabulary, how to communicate and how to use a book. Give your baby the opportunity to explore books on his or her own. Let them play with and explore baby-proof board or cloth books as they would with any other toy. Childhood is a time of discovery and wonder. A short time in a long life when there is magic in the world. Twenty years from now, whatever you now do outside the home will little matter. The work you did in the home will be what truly matters. Make the effort to make reading together a part of the loving relationship you build with your children. November is Picture Book Month, a great time for dads to find wonderful new picture books for together reading. You can browse through a long list of excellent picture books by clicking here. 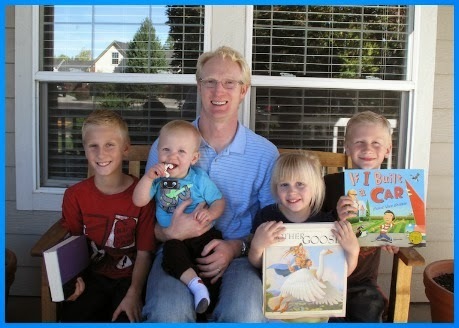 Jake Ball started childrensbookstore.com in 2006 after realizing that there was no website that was a truly independent bookstore that is 100% dedicated to juvenile literature. He loves engaging with the authors, illustrators and publishers who work hard to produce high quality children’s literature. Jake and his wife have 4 beautiful children. These poor children are often used as product testers and they have more books than might be considered healthy. Childrensbookstore.com is based in Meridian, Idaho U.S.A. It serves the U.S. market with more than 269,000 juvenile titles available for immediate purchase. Childrensbookstore.com works with local and national organizations to promote literacy and reading for children of all ages. I love all this advice, especially "Reading together will take on a new level of meaning when your collection is deliberately selected rather than a hodge-podge of books of uncertain origin." Thank you for writing this! Happy Picture Book Month! Hmm... I guess I'll make it 2 people-that-share-a-same-sounding-first-name commenting! :) Great post Mr. Ball - I'll remember this when I have kids (which will be a long time from now :) )! Thank you both Eric and Erik. All the lessons in the article come through hard-learned experience with my own kids and the guidance of my book-loving wife. Thank you both Eric and Erik. The tips above are all hard-learned lessons with my own kids and the expert guidance of my book-loving wife.